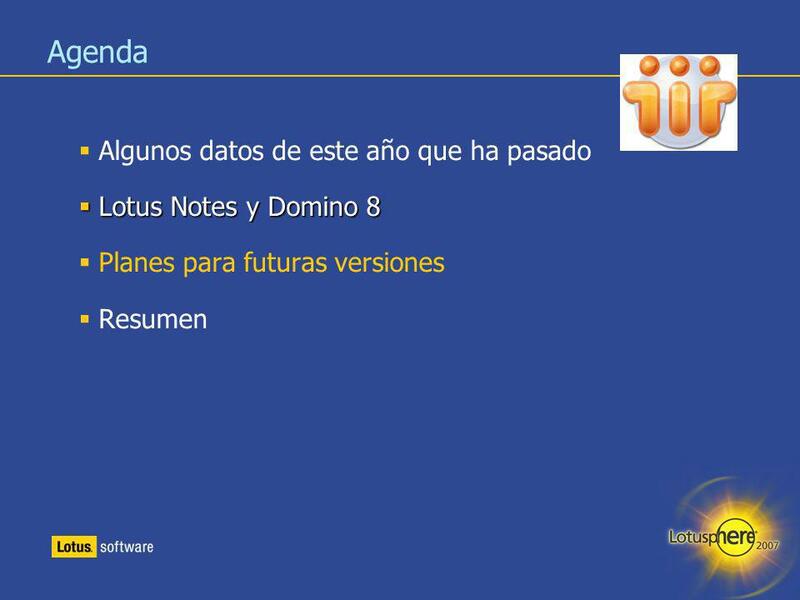 Planes para futuras versiones Resumen Today, I’m going to quickly bring you up to speed on the Notes and Domino business and recent releases. Then we’re going to turn our focus to Notes and Domino 8, as it heads into public beta. 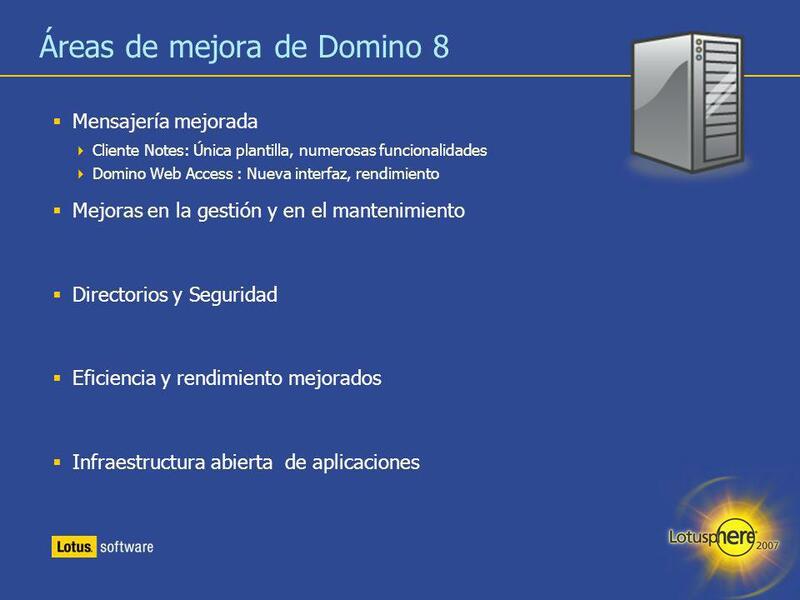 That’s right – I said Notes and Domino 8. We’re no longer using the code-name “Hannover” – we have formally announced that this major release is version 8. And though it’s been in limited beta for several months, we are now ready to get your feedback through our public beta. Then, we’ll turn our attention to the future. 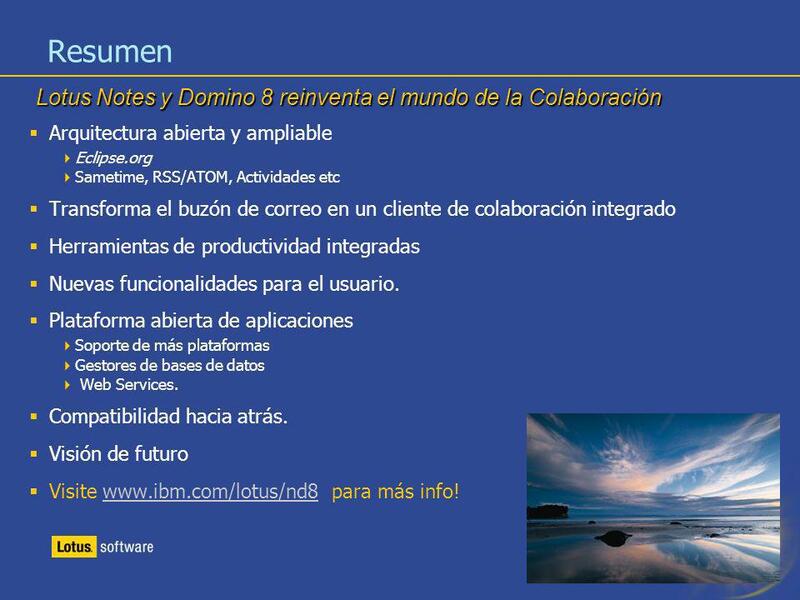 Not only does Notes and Domino have a long, rich history, but it also has an exciting and technologically innovative future. 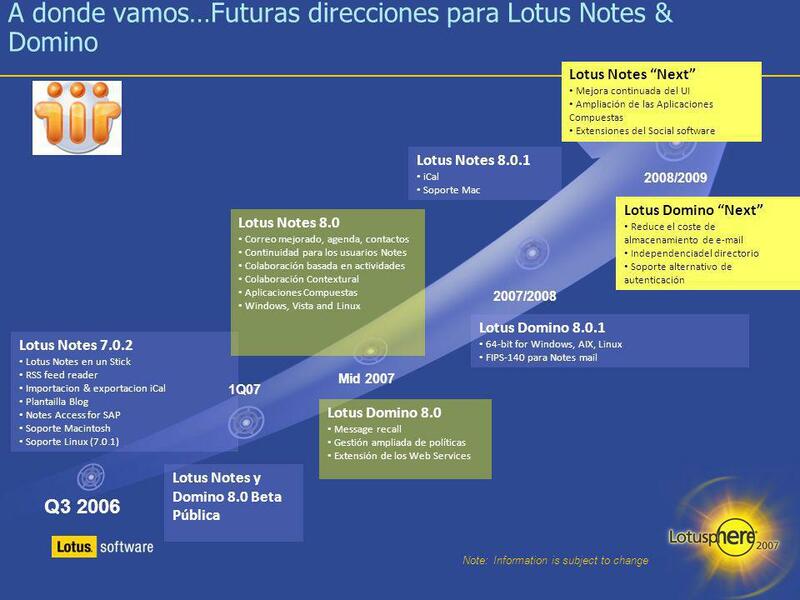 Notes/Domino continua creciendo 2 años de crecimiento sostenido en doble digito 9 trimestres consecutivos 30% de crecimiento en el 4ª trimestre para el negocio de Lotus La tasa de crecimiento es mayor que la del mercado Base de clientes en aumento 130M licencias de Lotus Notes® y Domino® Hemos aumentado en clientes a nuestra base de empresas 400 compañías están usando nuestra solución Lotus Notes Access for SAP The Lotus brand, led by Notes and Domino, had an outstanding 2006! And that followed a fabulous For the past 9 quarters in a row, we’ve continued to grow this business – thanks to your enthusiasm! 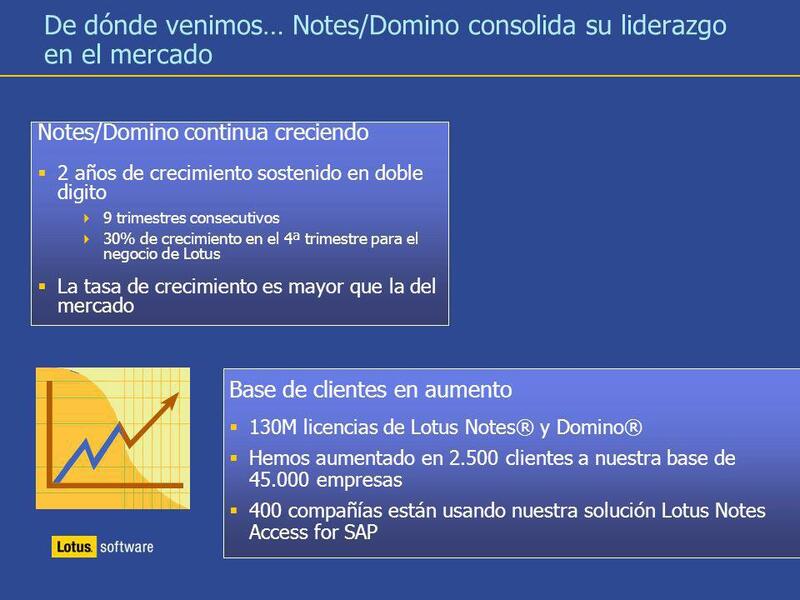 Notes and Domino is growing faster than the market is growing – that means we’re gaining market share. In fact, this year we’ve exceeded 130M licenses sold and we’ve added over 2,500 customers to our base of more than 45,000 companies around the world using Notes and Domino. 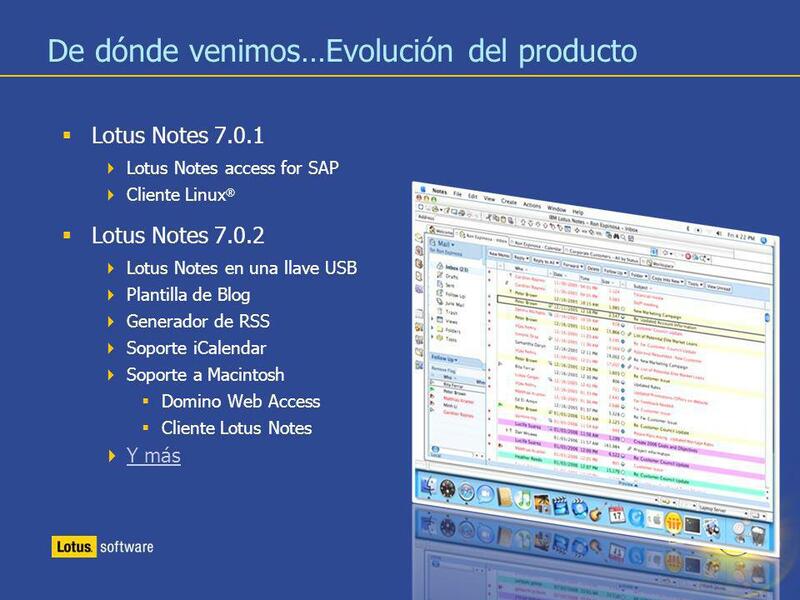 There are almost 500 companies and thousands of users in proof-of-concepts for our Lotus Notes Access for SAP solutions feature. 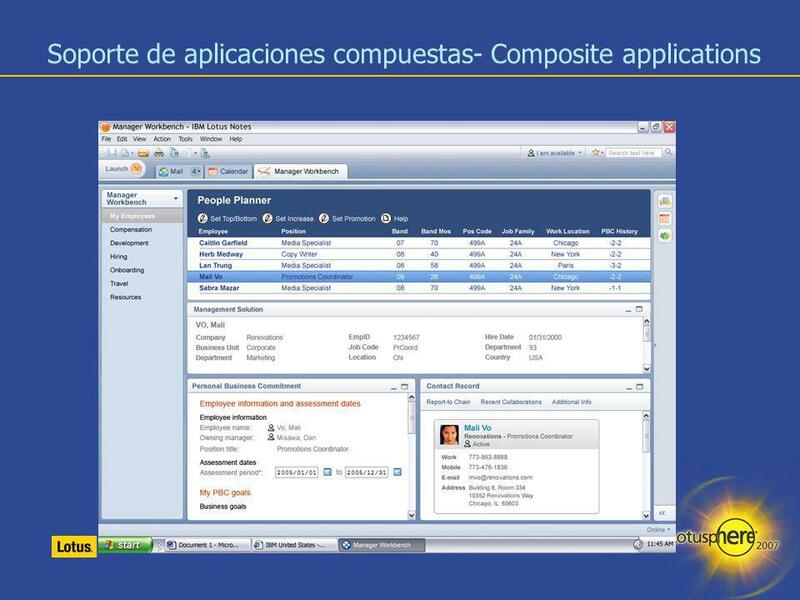 Released to market in May, 2006 it’s been a big hit with customers who are seeing a lot of benefit and immediate value and are beginning deployment of this new functionality. 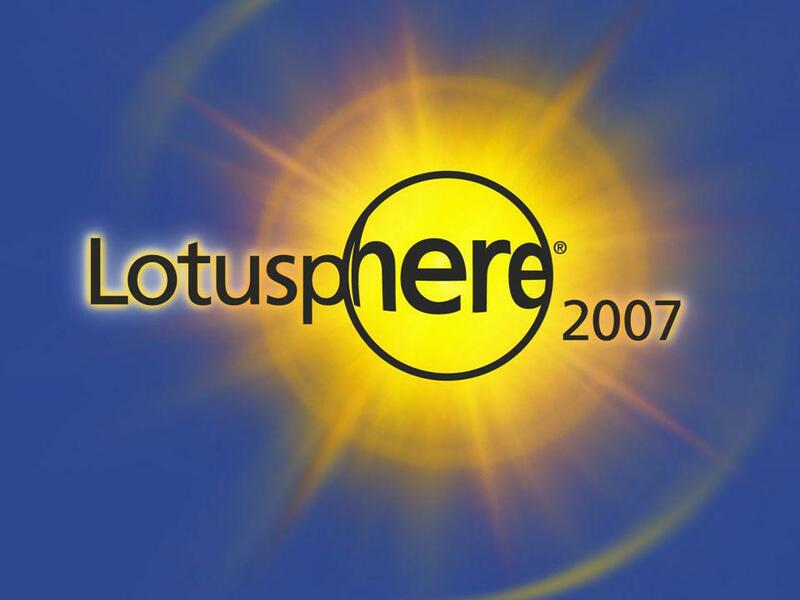 Lotus Notes access for SAP solutions provides employees expanded integration between SAP business applications and workflow into the security-rich Lotus Notes collaboration client. 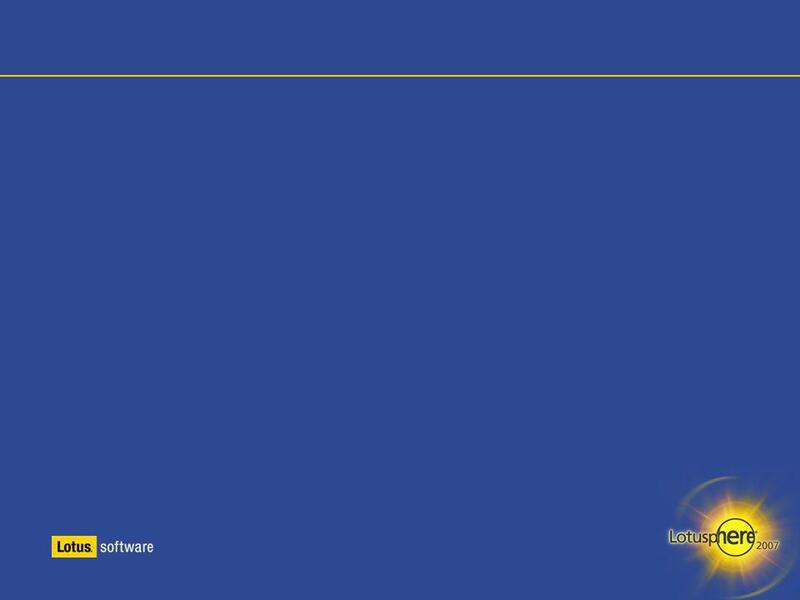 In the starburst, you’ll see an excerpt of the IBM CFO’s 2006 report to securities analysts. 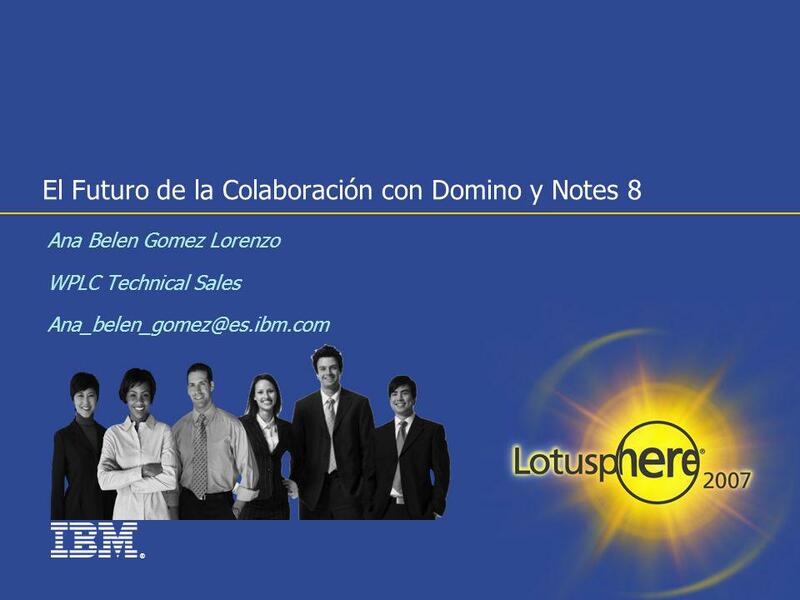 He specifically called out the performance of Notes and Domino among the many strong businesses within IBM. 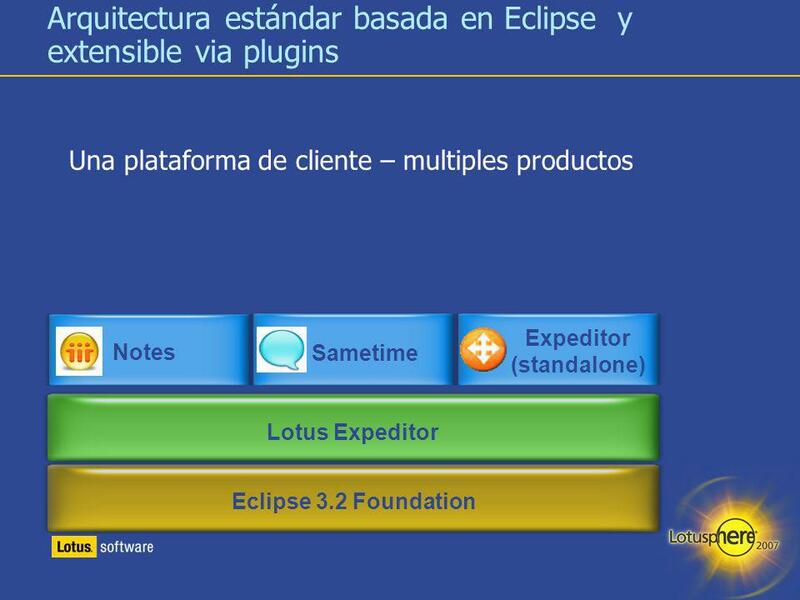 Mucho más que Arquitectura de cliente basado en estandar eclipse.org, extensible via plugins Soporte de aplicaciones compuestas Funcionalidades mejoradas Cliente totalmente integrado Control de presencia e IM de IBM Lotus Sametime® 7.5 Integración opcional: Lotus Connections/Activities y Lotus Quickr™ Colaboración basada en actividades Herramientas incluidas: presentaciones, documentos, hojas de cálculo Soporte Open Document Format (ODF) Soporte ficheros MS Office Sin coste adicional As promised, Notes 8 completely transforms your in-box into a tightly integrated, high performance, work environment. 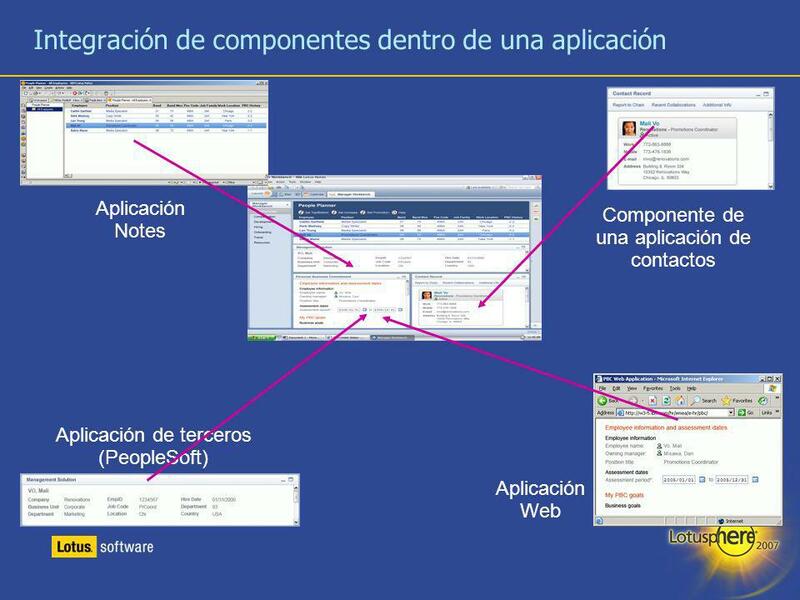 All the applications and tools you use all day will be accessible right from within Notes. Built on the eclipse standard, you can easily “plug-in” custom code that you can write or source. 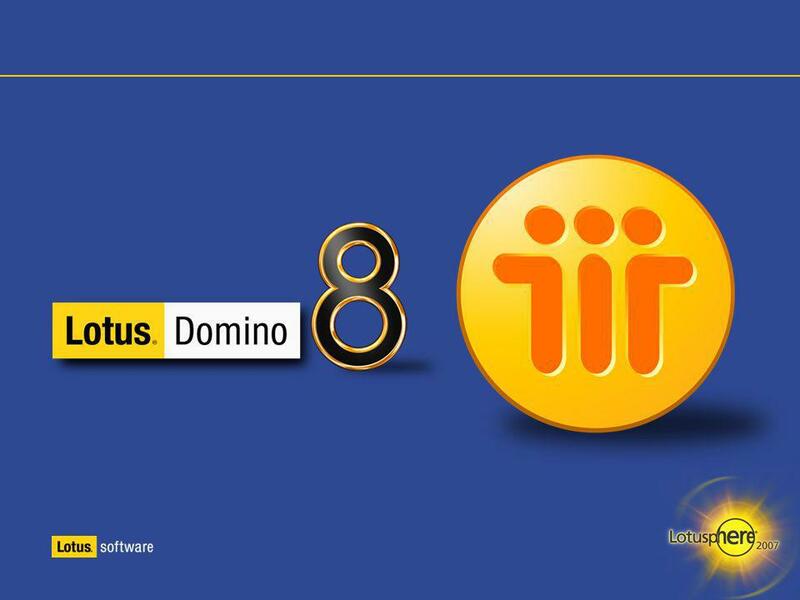 You can also easily integrate in your Domino apps, your composite apps, and all the applications and tools you do your real work in: Lotus Sametime, Quickr, Connections and the new IBM Productivity Editors. 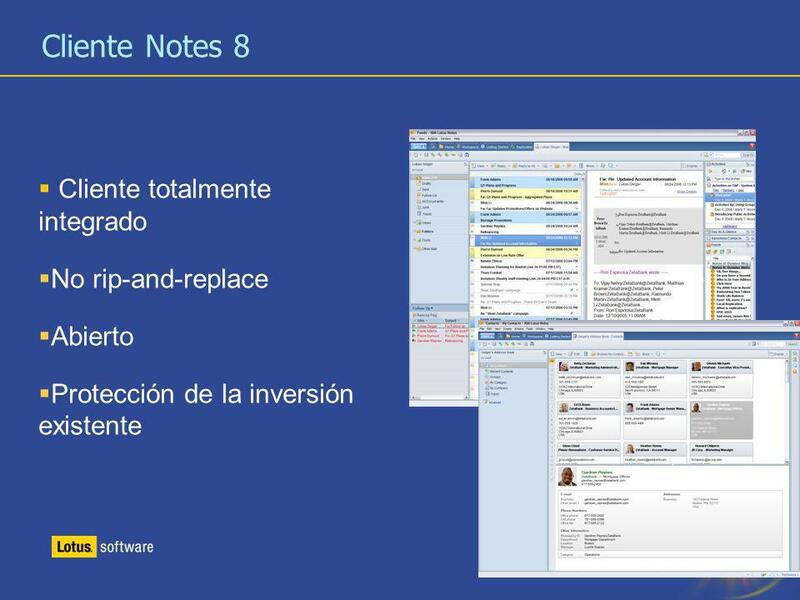 These editors are a new feature in Notes 8. They’re a set of tools that enable you to instantly create and edit presentations, spreadsheets and documents. They enable you to utilize the Open Document Format, which frees you from propriety file formats. And, you can even import your files in MS Office file formats. Save them back out as MS Files, ODFs or even convert them to PDF. 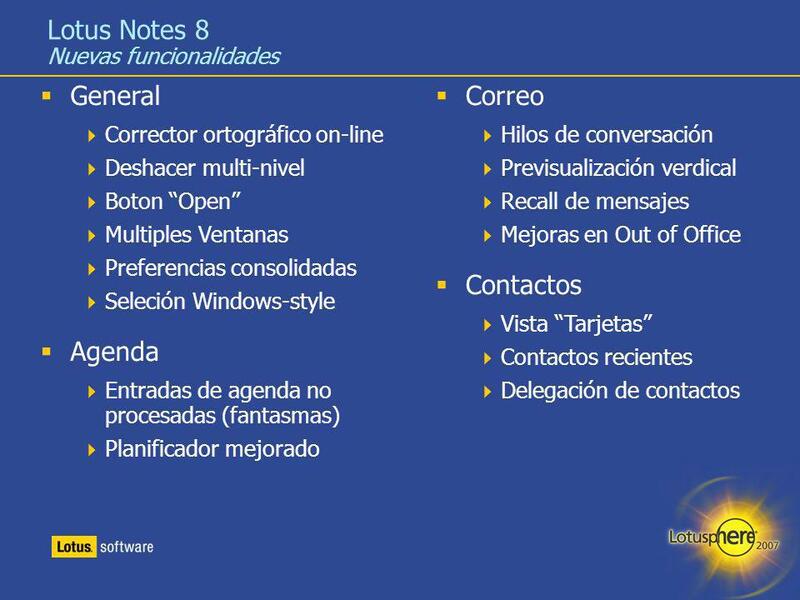 And because it’s a feature in Notes 8, there is no additional charge! 24 Demo Notes 8 demo. 26 Demo Notes 8 demo. 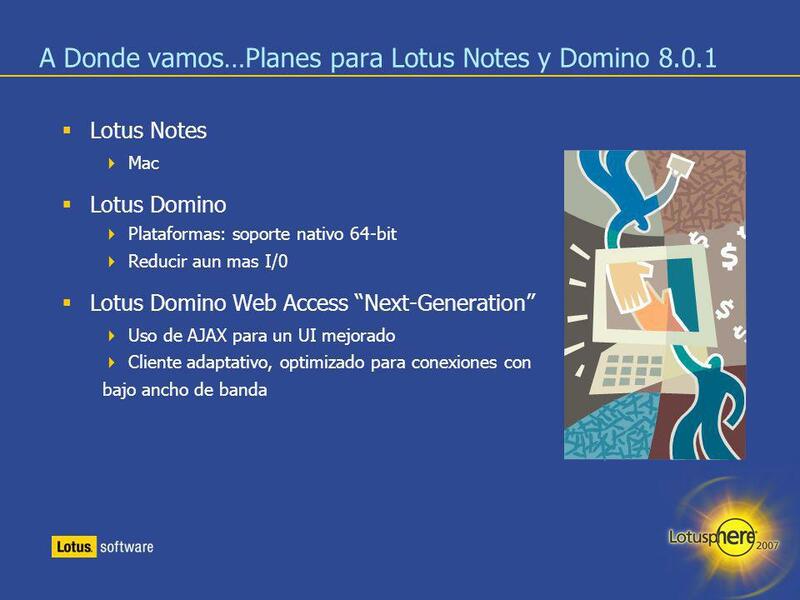 Mac Lotus Domino Plataformas: soporte nativo 64-bit Reducir aun mas I/0 Lotus Domino Web Access “Next-Generation” Uso de AJAX para un UI mejorado Cliente adaptativo, optimizado para conexiones con bajo ancho de banda Notes 8.0.1 Looking beyond Notes 8, we’re already hard at work on Notes Look for Mac support in the timeframe as well as support for iCal subscriptions, the ability to port Notes 8 on a USB memory stick and extensions to the search capabilities in Notes 8. Domino 8.0.1 In the Domino 8 timeframe, we plan to beta test 64-bit support (native). In we plan to make that generally available - initially on Windows and AIX, with the remainder of the platforms to follow. We will support the FIPS 140 standard for Notes mail (relevant to the US Federal Government.). And we’ll extend security and continue that focus on reducing the I/O footprint. 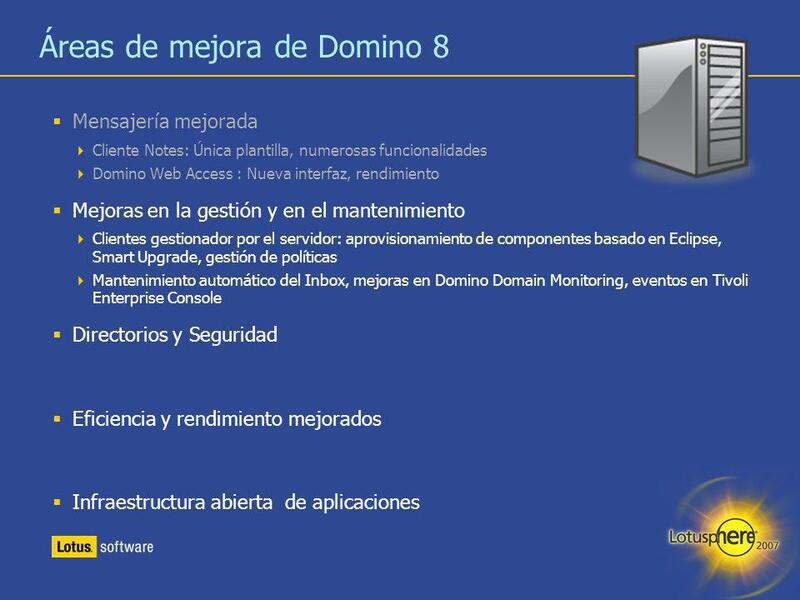 DWA 8.0.1 In we will be delivering the first iteration of what will be the next evolution of Domino Web Access. This update to DWA includes further exploitations of our AJAX based capabilities to deliver a modernized user experience. Many users of DWA may not realize that DWA was one of the first commercially available AJAX based applications, delivered to market about 3 years before the term AJAX was created. These improvements will deliver a dynamic interactive web client that will be able to adapt to your work environment and needs. For example, in we plan to deliver a low bandwidth optimized UI. Initially it will be a subset of the mail & contacts capabilities but over time we will grow that out to include all the capabilities of the product. In addition over time, we will be delivering the next wave of collaborative capabilities, such as activity-centric collaboration, to web client users. Also look for other innovations that will provide the tools to help you manage “ overload” and be more productive and responsive. 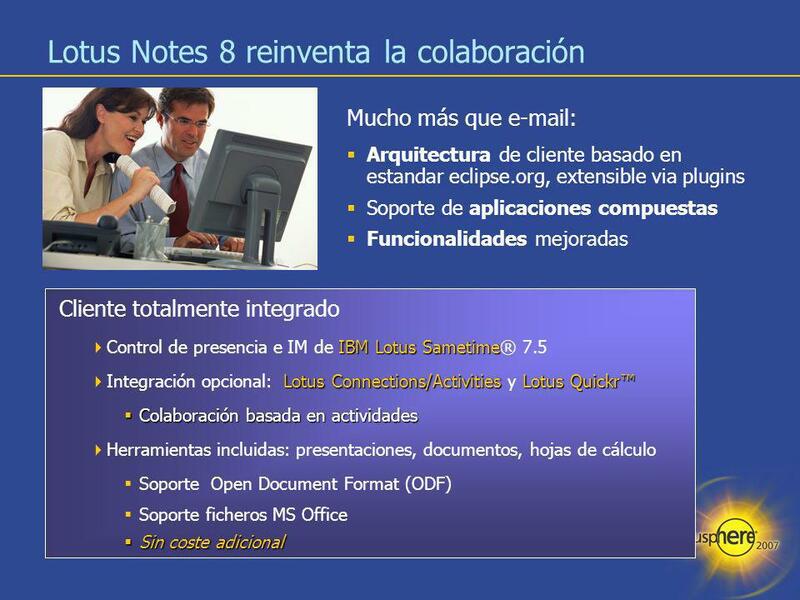 Resumen Lotus Notes y Domino 8 reinventa el mundo de la Colaboración Arquitectura abierta y ampliable Eclipse.org Sametime, RSS/ATOM, Actividades etc Transforma el buzón de correo en un cliente de colaboración integrado Herramientas de productividad integradas Nuevas funcionalidades para el usuario. Plataforma abierta de aplicaciones Soporte de más plataformas Gestores de bases de datos Web Services. Compatibilidad hacia atrás. Visión de futuro Visite para más info! 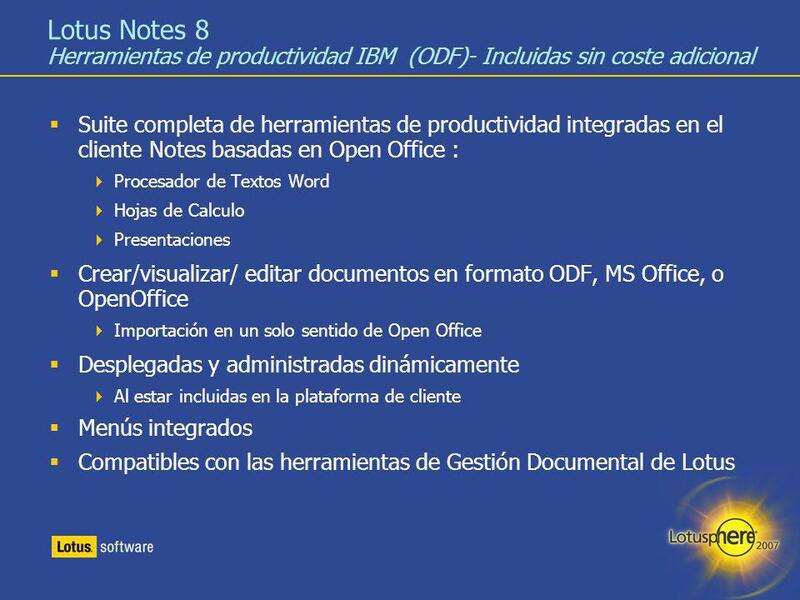 Key points: Notes 8 is a lot more than just . 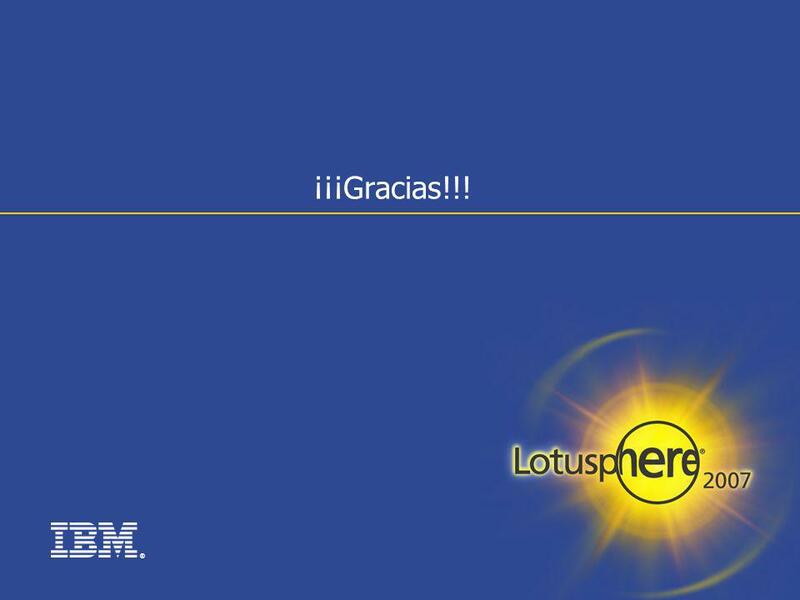 It redefines business collaboration by providing a tightly integrated, high performance work environment. 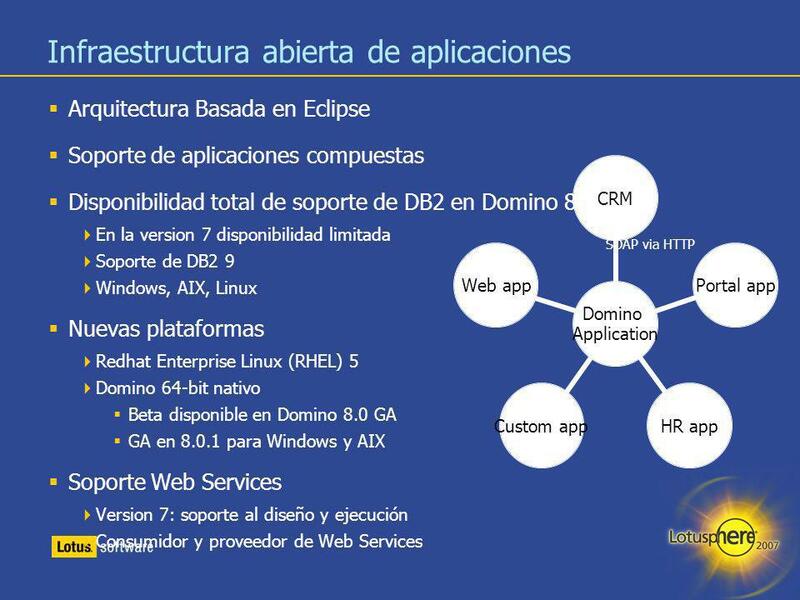 It’s customizable and leverages open standards, like Eclipse. 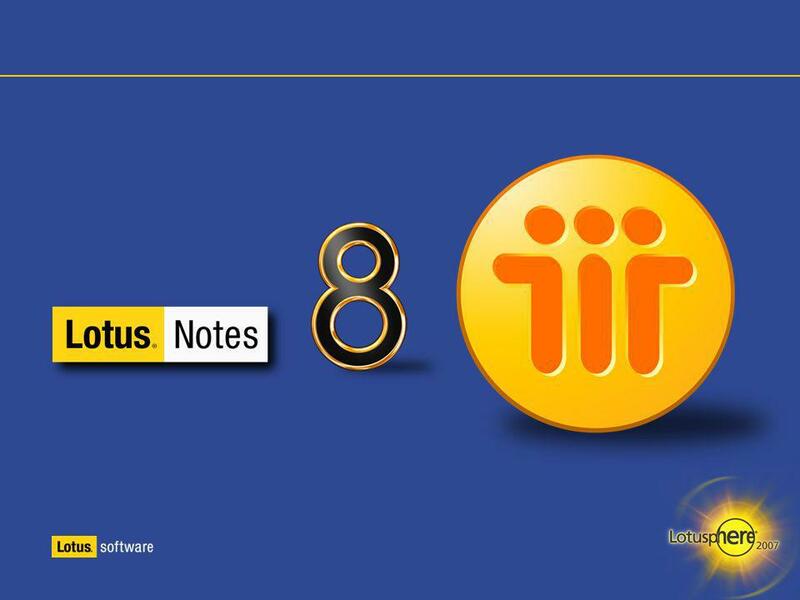 The Productivity editors are included in Notes 8, at no additional cost. No rip and replace overhaul! 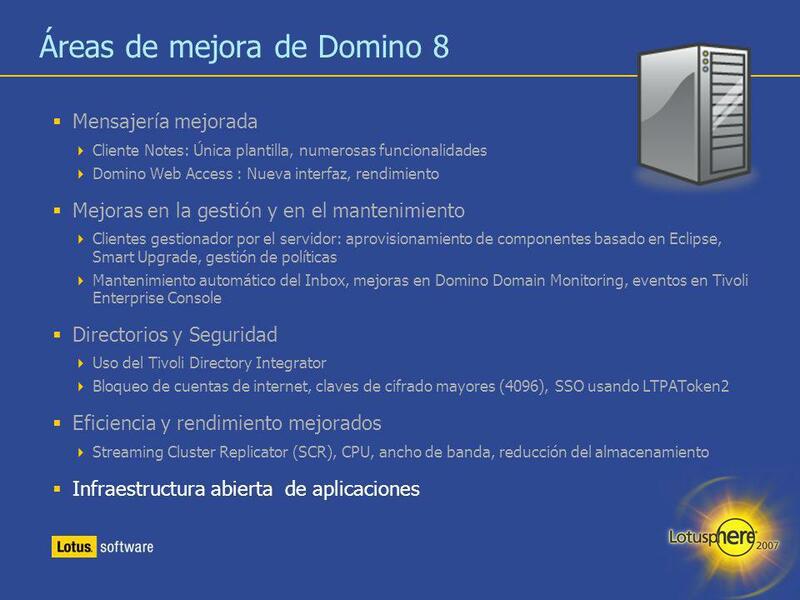 Set the stage for exciting enhancements to Domino in the next major release! 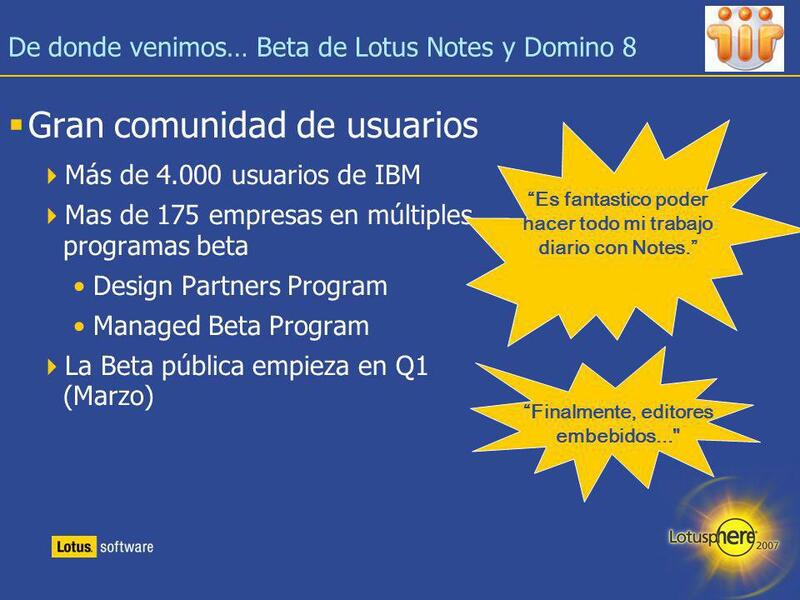 Become part of the excitement: Beta test Notes and Domino 8. And let us know what you think! Descargar ppt "El Futuro de la Colaboración con Domino y Notes 8"